For most Americans, the 401(k) is their most valuable asset for retirement. Illustrated in the graph below is a 401(k) worth $300,000. Assuming we lived in a perfect world (no taxes on the 401(k) when we go to take money out), we’d have all the $300,000 to use and enjoy. Unfortunately, we’ve got to deal with our “progressive” tax system that allows the government to take their fair share first (pre-tax really means you’re just postponing the tax). 1. Ignore It. Imagine your doctor discovering a malignant tumor within your body. You could ignore it, but if you do, all the tumor is going to do is grow and get worse. You could do the same with your tax-infested 401(k) or IRA, just pretend the tax tumor doesn’t exist and pray the next President will demand Congress repeal the tax law and give you the 401(k) tax-free (this would be a miracle!). 2. Spend It. Yes, spend it. The financial world often tells us not to, but if you don’t spend it, Uncle Sam will get his fair share at some point anyway. And at what tax rate? If you’re like most people and believe that taxes will increase, spending it starts sounding better and better. Bigger barns don’t always mean more money in your pocket. 3. Stretch It. The CPAs and technical folks love this option because they contend that the government is “letting” you defer the taxes. True, but what if tax rates do go up in the future? And what about inflation—if you keep deferring these dollars off into the future, what will they be worth? This idea of deferring the taxes and only taking “minimum distributions” for the rest of your life and that of your heirs, makes you wonder if deferring the enjoyment of the money is all that it’s cracked up to be. This strategy never allows you to eat and enjoy the cow. It’s only promising you a little cream off the top, while the financial world gets to use and enjoy the whole thing. 4. Insure It. Assuming we can all agree that everyone’s going to die, why in the world would anyone NOT own some amount of tax-free “Whole Life” life insurance? In most cases, this is the only way to guarantee tax-free money to replace the tax that will surely be due at death on the 401(k) plan (unless your beneficiaries stretch it). Life insurance is the only asset that guarantees a certain amount of cold-hard, tax-free cash when you need it, and not a minute too late when it comes to kicking the bucket. And “tax-free” beats “taxes” every time. 5. Convert It. This is when you take the taxable cow (your existing IRA) and magically turn it into a tax-free cow. The process is called a Roth Conversion and any retirement specialist that knows anything about 401(k)/IRAs will be able to help you with this. Keep in mind that when and if you do convert a traditional IRA to a Roth IRA, Uncle Sam will want his taxes right then and there. Look before you leap! In summary, the tax tumor buried in your 401(k) must be dealt with. To get it out will be painful. You can pay Uncle Sam now, or pay him later; he really doesn’t care. The government will one day get their fair share. Your responsibility is to learn your options in order to give you and your family the best chance for keeping as much of your hard-earned money as possible. That’s why it is so important to work with a retirement specialist. Be sure to talk to your financial advisor about your retirement options. 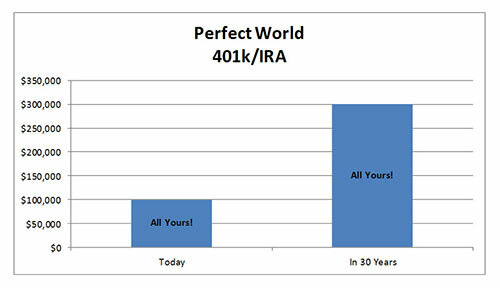 You’ll be glad you did… and will most likely worry less about your retirement as a result. As Farmer Brown always says, “Why pay taxes if you don’t have to?”You’ll be glad you did… and will most likely worry less about your retirement as a result.